Evey's Creations: Home Alone 2 inspired Holiday Sign and 24 Holiday Movie Crafts and Recipes! Home Alone 2 inspired Holiday Sign and 24 Holiday Movie Crafts and Recipes! Christmas Movies are the best, right?! Y'all. 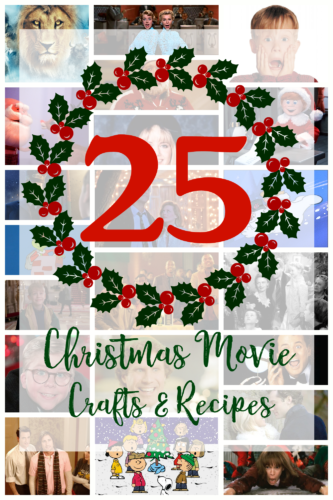 I, along with some of my amazing Bloggy friends are happy to bring you, "25 Christmas Movie Crafts and Recipes"! Yup. Crafts and Recipes all inspired by our favorite Holiday movies! 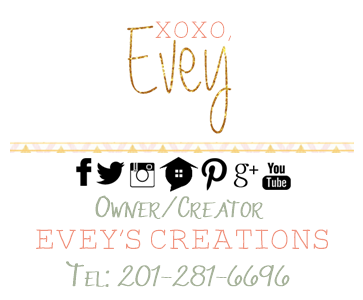 If you are following along in the Blog Hop, you are likely coming to me from Emily's blog. My project is a sign from my FAVORITE Holiday movie EVER, "Home Alone 2, Lost in New York". I know, I know...most people don't love sequels, but THIS sequel is every bit as hilarious and wonderful as the first movie! 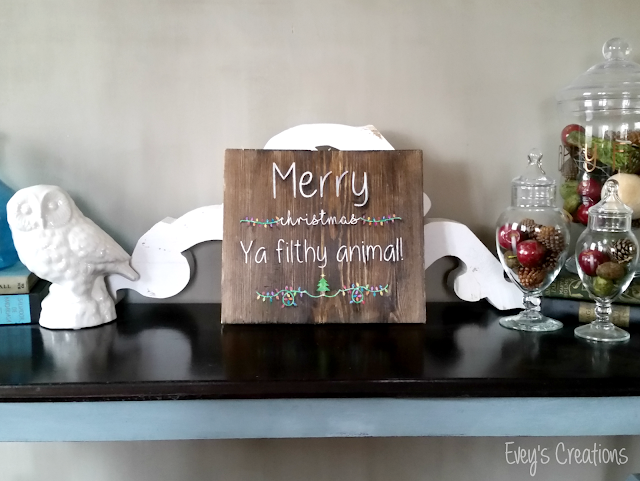 I thought I'd turn my favorite quote and scene from the movie into a wooden Holiday sign so of course, I pulled out my favorite GREEN paints and stains, and my trusty Cricut Air 2! Seriously, isn't that just the best sign EVER?! :) Here's how I did it! I started out by taking a pine board and staining it with my favorite Stain+Finish from CeCe Caldwell's Paints in Kukui. 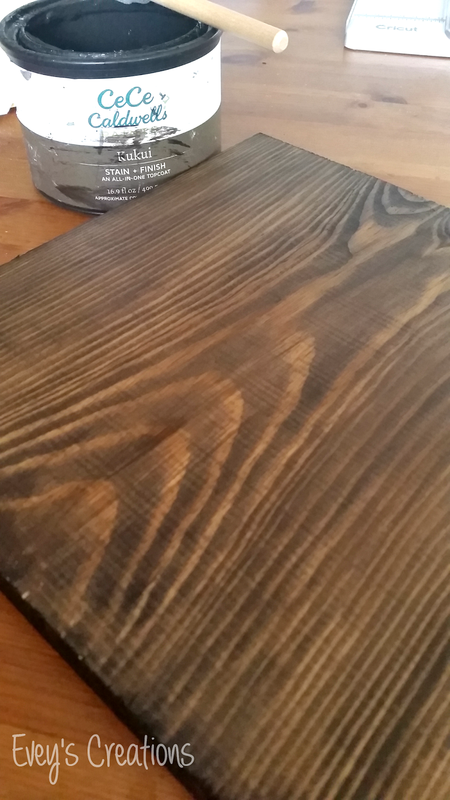 It's important to let the stain fully dry and cure for at least 24hrs, otherwise the vinyl might not stick to the wood properly and you will get bleeding when applying the paint. I uploaded a Holiday font into Cricut Design Space (font is called "I love Christmas"), then cut some vinyl out for a stencil, I used regular indoor vinyl, not permanent or outdoor vinyl. Instead of weeding around the letters like I normally do, I weeded the letters OUT, leaving the background for the stencil. I transferred the vinyl with some transfer tape, making sure to really smooth the vinyl down onto the stained wood. I used CeCe again, this time their chalk+clay paint in "Simply White". Make sure you use a good stencil brush and stencil in a circular motion to reduce the risk of bleeding under the stencil. I spruced it up with some Unicorn SPiT in their new Sparkling Stains line! In person, those cute string lights just sparkle away, when the light hits the sign! I sealed it all up with my favorite wax, Daddy Van's Clear Wax in Lavender. I'm in love with it! Make sure you check out all of the other posts in our awesome Blog Hop! 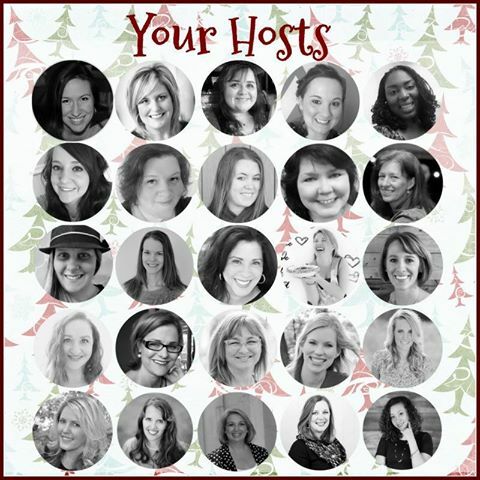 There are a total of 25 talented bloggers gathered together to share with you all the wonderful crafts and recipes you can make this Christmas season, based off of some of the most beloved holiday classic films. Each blogger will lead you to the next, so be sure to finish the hop all the way through to the end for all the Christmas movie goodies! Thanks for stopping by! Which Holiday Classic is YOUR favorite? Or are you all about the Hallmark Channel Holiday line up!? This is so awesome. I love this movie and this line is the best. LOL, it's great hopping with you. All of the Home Alone movies are Christmas movies I watch time and time again. I love your sign and that famous quote is perfect. It's so creative! My brother used to make me watch the Home Alone movies all the time. This brings back memories. What a cute sign! I LOVE Home Alone 2. It definitely falls under one of the top sequels ever. I love this sign, I'd have this front and center every year! How adorable is your sign!! One of our all time favourite movies to watch at Christmas!